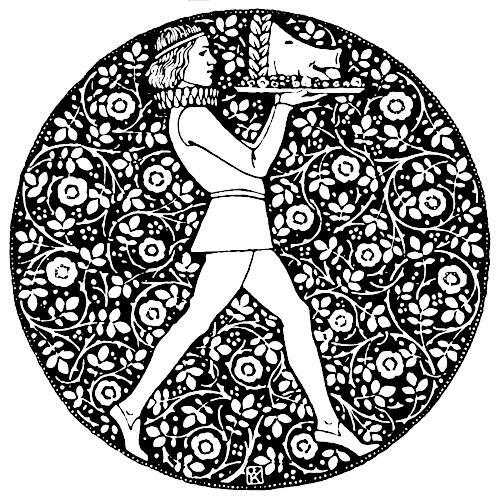 This young man carries a platter of food: a roasted pig’s head with fruit or vegetables around it, on a platter. He wears a ruff round his neck, a tunic over a long-sleeved shirt, and simple shoes; presumably he also wears hose, or tights. He carries the platter level with his face. 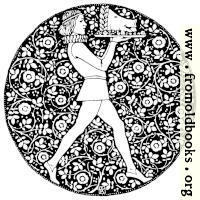 The image is circular and the space that itsn’t the food or the youth is filled with stylized roases and their leaves and runners. Theres a criblé border round the outside of the circle. All in white on black.